In the U.S., 20.4% of adults (50 million) live with chronic pain (https://www.cdc.gov/mmwr/volumes/67/wr/mm6736a2.htm). The recommendation? Add chiropractic medicine to your usual medical care for treating back pain (https://jamanetwork.com/journals/jamanetworkopen/fullarticle/2680417). As Dr. Paul Braadt explains, patients with chronic pain often travel up the hierarchical healthcare ladder through a referral pattern—seeing multiple specialists for pain management. If your treatment journey is not producing the results you want, Dr. Braadt recommends “a different kind of spine specialist…a mechanical [one]…since most spine pain is mechanical in nature.” For the skeptics of chiropractic care he states, “…studies indicate chiropractic is one of the safest modalities in healthcare…” and “if people are not 50% improved within 6 weeks, we know we’re on the wrong track.” With chiropractic medicine, we are moving from the current “business of medicine” model back to the “art of medicine”. HIV Identity: Who are we? For years Joanna was mis-diagnosed with anxiety and depression and placed on anti-depressant medications that didn’t work for her. After a mental crisis, however, she saw a psychiatrist who diagnosed her with Bipolar II Disorder. “The terror of the diagnosis turned into a gift,” Joanna recounts. She educates listeners about some of the characteristics of Bipolar II such as 1) “mixed features” of hypomania—heightened emotional or energetic state—and depression which present simultaneously, and 2) rapid cycling which is four or more episodes in a year. “It’s easy to ‘pass’ with Bipolar II and the world not know you’re suffering,” she adds. Joanna touches on the difficulties people may face receiving a correct diagnosis due to stigma, gendered bias, and similar symptoms with other mental disorders. For those living with mental illness, Joanna offers numerous suggestions for navigating through the healthcare system and the importance of finding support and trusting your gut. In this podcast, Matt Neifert, owner of Agape Blends, shares the medicinal benefits of hemp CBD. Cannabidiol (CBD), found in hemp, is a chemical compound that effects our body’s cannabinoid receptors “…found in the parts of the brain that handle cognition, memory, psychomotor skills, feelings of rewards, and pain perception…CBD cannabidiol interacts with the receptors to reduce feelings of pain or anxiety” (https://cbdoilreview.org/cbd-cannabidiol/cannabinoids/). Matt explains the difference between hemp CBD and medicinal marijuana and how people have found relief from hemp CBD when other pharmaceutical medications did not work. Matt offers advice for how to talk with your clinician when taking hemp CBD and provides crucial tips for asking about third-party testing regarding the quality and purity of a product. 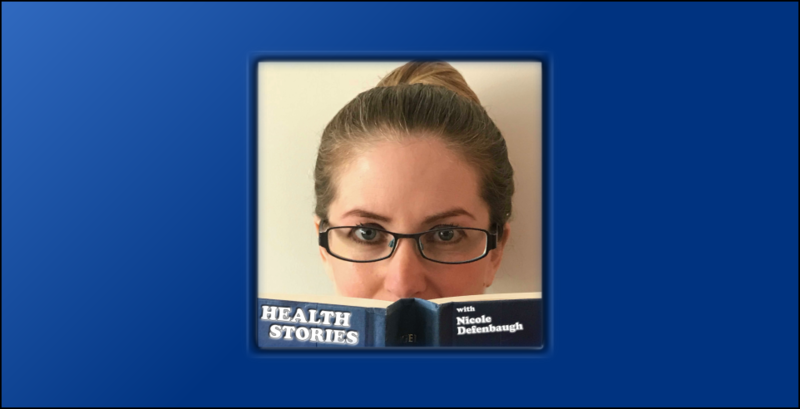 In this week’s podcast, Health Stories’ host Nicole Defenbaugh shares her personal journey with ulcerative colitis (UC) and provides listeners with the reason for starting the podcast. Jerry Petrole, the IT wizard behind the podcast, takes his turn as the host for this unedited interview. I was recently interviewed on the Association of Communication in Healthcare podcast entitled: Healthcare Communication: Effective Techniques for Clinicians. In the episode I discuss ‘The Art of Listening with Empathy and the Clinician Benefits’. Please give a listen! After 13 surgeries, all for different conditions (e.g., brain surgery, C-sections, appendectomy, car accident), Emily has learned a thing or two about pre- and post-surgery preparation, asking questions, types of anesthesia, and caregiver support. With her 3rdupcoming C-section, Emily shares the steps and un/expected moments she experienced and reminds listeners that “Patients are not standard. Different people respond differently to different drugs” in discussing her adverse reaction to anesthesia. Surgical procedures and recovery processes have also changed over time in healthcare, as Emily recalls the speedy and fairly easy recovery from a recent sinus surgery compared to sinus surgery from a decade ago. In providing insights, Emily suggests asking the surgeon any and all questions, calling the surgeon’s office with additional questions, finding patient narratives to understand others’ experiences, and mental preparation techniques such as meditation. The podcast ends with advice for your caregiver so they can be effective in their caregiving role. Ten years after being diagnosed with gestational diabetes, Melanie faced another diagnosis, Type 2 diabetes, and recounts the symptoms: thirst, frequent urination, dry skin, forgetfulness, occasional blurred vision and slow-healing wounds. As she states, “…those things are such a normal part of aging, we don’t think to connect those to diabetes until you get a diagnosis”. Melanie also addresses a common stereotype of diabetes, obesity, and shares the story of a physician who assumed Melanie (who weighs 135 lbs.) weighed 400 lbs. based on her blood sugar levels and hypertension diagnosis. Regarding diet, Melanie informs us that “healthy” foods such as granola, dried fruit, and refined sugars: bread, pasta, and rice are, in fact, not good for controlling diabetes. With a genetic predisposition to having diabetes, Melanie chose to manage her condition through diet, exercise, and lowering her stress levels, addressing her diabetes holistically. Over the year she learned what works for one person doesn’t work for others—you need to figure out what works for you.